On Good Friday 2013, a modern live dramatic performance representing Christ’s Passion from the Last Supper to the Crucifixion will be played out through out the streets of Belper and in iconic local venues engaging the public in the action. Hope will be suporting the Belper Passion play with the provision of refreshments in the Memorial Gardens at the climax of the play. Directed by Belper-based actor and director Larry Waller, the play will begin at noon in the grounds of the Methodist Chapel on Chapel Street. More information about the play can be found here, but meanwhile here’s a trailer that the team behind the play have posted on YouTube. Belper Street Angels has received a fresh funding boost from the town’s Rotary Club following last year’s annual carol concert by the Dalesmen’s Male Voice Choir. The project, which is supported by Hope for Belper, received a cheque for £600 after being nominated as one of a series of local charities to benefit from the proceeds of the concert, organised each year by the rotarians. It came about after Street Angels co-ordinator Rachel Marszalek and secretary Julie Degg gave a talk to the Methodist Church Ladies Group last year. One of the ladies present told her rotarian husband about the project which he then nominated to receive a share of the cash. 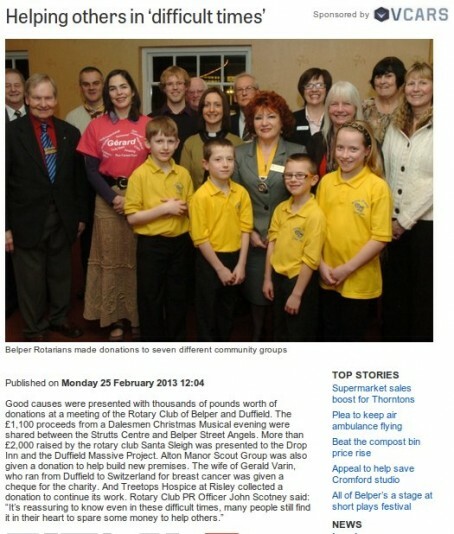 Here’s how it was covered ni the Belper News. Belper Street Angels has carried out its first trial of a new 11pm -3am lateshift and is seeking new recruits to help make it a permanent feature. The project, launched eight months ago, has seen teams of volunteers patrolling the town centre and estates between 8-12 each Friday evening. In the longer-term, the plan is to launch two regular weekly shifts, an early evening shift focused on the estates and a late night shift focused on the town centre. For the next few months, however, the project team plan to alternate between the two until enough new volunteers are recruited. Anyone wanting to volunteer should contact Rachel at Revrachelemma@gmail.com. Some updated information about the project can be found on the Street Angels page. A message of Hope – five years on! It is now five years since the first post on the then newly-launched Hope for Belper blog went live and H4B officially came into being. Since then, it has grown from a small group of Christians praying and planning to a partnership of eight churches alongside schools, the Town Council, local police and many friends and neighbours. More than 50 volunteers are regularly involved in delivering the two main projects, ‘The Basic Idea’ and ‘Street Angels’ with more interest being shown all the time. Over 30 separate projects or events have been facilitated by Hope over the years, with more than 70 young people attending Dreamschemes, in excess of 400 children and parents enjoying a film at the Ritz, over 3,000 cups of hot chocolate given away and around 350 families provided with crisis food boxes. Hope for Belper chair Gareth Greenwood said: “It has been a remarkable five years and (almost) entirely an absolute joy! It has felt like a town coming even closer together and a local church embracing an opportunity to love, and love being a part of its community. Here’s a pictorial reminder of some of the projects we have undertaken in the course of those five years from our very first project – handing out cups of hot chocolate in the Market Place on New Year’s Eve 2007. What they all have in common is an element of celebration and a strong sense of community and shared experience. Author Paul LinfordPosted on December 7, 2012 Categories GeneralLeave a comment on A message of Hope – five years on! Hope’s Basic Idea food bank project has been boosted by Harvest Festival contributions from several local churches over recent weeks. But organisers are continuing to appeal for donations to help needy families in the town with demand increasing over the past 12 months. Now in its fourth year, the project has helped 138 households in the Belper area in 2012 to date, having provided assistance to 111 across the whole of last year. Some updated information on the project, and how you can help, can be found here.